Cryptomundo » Texas Bigfoot Conference Today! I will have a rare brochure from Peter Byrne’s Bigfoot Research Project signed by Peter himself. 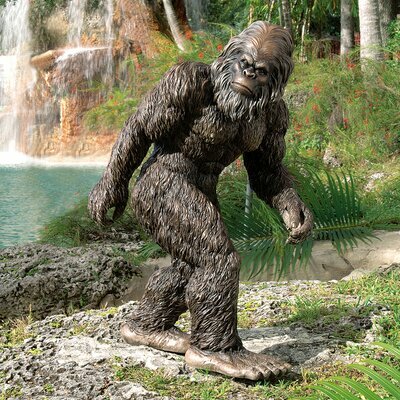 A Design Toscano Garden Yeti. Some cool artwork done by artist RobRoy Menzies that are each signed by all of the conference speakers. These prints are 12 x 18 in size. This entry was posted on Saturday, March 16th, 2013 at 6:00 am and is filed under Bigfoot, Bigfoot Report, Conferences, Cryptozoologists, Cryptozoology, Cryptozoology Conferences, Destination Truth, Evidence, Expedition Reports, Eyewitness Accounts, Folklore, Footprint Evidence, Photos, Pop Culture, Sasquatch, Television. You can follow responses via our RSS 2.0 feed. You can skip to the end and leave a response. Pinging is not allowed. Is this the same one you have in East Texas? Sorry I am missing it. Particularly with Munns, Meldrum and a number of others there who missed ’09. How many attended this conference? This was of the first conference I’VE missed. Anyone know if there’s going to be any events up this way (Oregon/Southern Washington)? Was attendance better than it had been in the past few Tyler events? Was attendance greater than what had been at Tyler? Oh man, Redfern was there? Now I’m sorry indeed. We may disagree, but I like the way we disagree.